Check out the Ace rebates on tools and more just in time for Father’s Day. 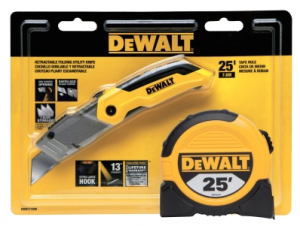 Get $5 back by mail when you buy a DeWalt 25′ Tape and Knife set. Get $5 back when you buy a Craftsman Clench Wrench. Get a $5 rebate when you buy a Craftsman 17-piece screwdriver set. Get $2 back by mail when you buy a Craftsman Slide Locking Utility Knife Set. There are also mail-in rebates to be found on insect repellent and pest control products. Get $2.50 back by mail when you buy The Pantry Pest Trap 2pk. Get $6 back by mail when you buy a Cutter Backyard Bug Control Mosquito Repellent Lantern. Get a $2 rebate on Deep Woods Off Insect Repellent. Your purchase must be made between May 26 and June 30, 2013, to qualify. Members of Ace Rewards can submit their rebate claims online and save on postage.